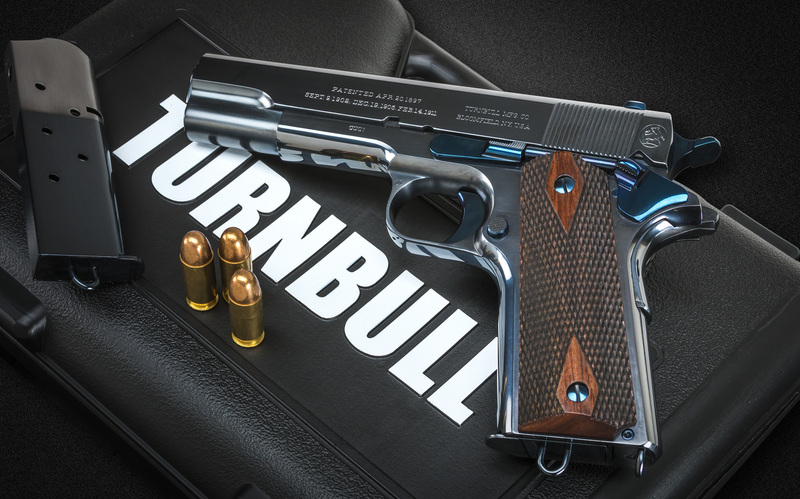 Turnbull Restoration is proud to announce a limited edition recreation of the iconic Commercial 1911 Government Pistol. The pistols will all have the early style commercial finish that was applied to them in their original manufacture in 1912. These .45 ACP pistols are set to be released on July 4, 2017 to mark their significance in the history of American firearms. The Turnbull Commercial 1911 Government will be finished in the circa 1912 early style, including a high polish charcoal blued slide and frame. The one piece solid steel trigger as well as the slide stop hammer and grip screws are nitre blued for strength. Two 2-tone magazines with the then standard lanyard loop are included. Serial numbers and other stampings will be consistent with the style used on the originals on the left front of the frame. Every pistol will have Turnbull’s “Turning Bull” mark on the left rear of the slide. Each Turnbull Commercial 1911 includes a Turnbull branded leather case. The Commercial 1911 will be available for order from Turnbull starting on Independence Day. Production is limited to serial numbers C001-C020. Customers can select any of the remaining numbers when they order. The Commercial 1911 will retail at $4,995. Customers should visit Turnbull Commercial Model 1911 for more information and to order. Turnbull is known globally for the ability to take even the most damaged collectible gun and return it to its original look, feel and function. They offer a line of new production firearms that incorporate the same quality look and feel as the collectibles they are famous for restoring. Also available are authentic vintage firearms of many iconic brands from private collections that Turnbull has purchased and inspected, cleaned and restored where needed. Now in their 3rd decade, Turnbull Restoration Co., Inc. has maintained a strong commitment to building firearms the way they used to be built. Founder and CEO Doug Turnbull is best known for his mottled color case hardening which stands out as the most striking and unique. Turnbull offers other reproductions as well as a full array of the finest and most respected restoration services in the shooting trade. Please visit us at www.turnbullrestoration.com for more information.